Ajo (pronounced ahhh-ho) is a gem of a small town in the middle of nowhere-the vast Sonoran Desert of southern Arizona. Locals joke that this is the place where summer secretly spends the winter, for we have clear warm weather prevailing year round. As a visionary copper-company town created in the 1920s, Ajo was designed around a gracious Spanish Colonial plaza and two handsome white adobe churches. This spectacular heart of town, along with 98 of our earliest residences, entered the National Register of Historic Places in the late 1990s. Just up the street from the plaza is the town's architectural masterpiece, the 1919 Curley School, also on the Historic Register.& It is currently being transformed into a thriving arts center with living and work space for 30 artisans and their families. This 8.9-million-dollar endeavor completed by June, 2007, allowing artists from around the country to discover the joys of sunny days, clear light and the inspiration of pristine landscapes. BLM wilderness, Cabeza Prieta National Wildlife Refuge, Organ Pipe Cactus National Monument and the Tohono O'odham Reservation effectively surround Ajo. They not only buffer it from urban sprawl, traffic jams and smog, but provide visitors with a unique desert ecosystem laced with hiking trails, pre-Columbian foot paths, Native American history and artifacts, wide open spaces and unusual flora and fauna. Ajo receives about nine inches of rain annually, which accounts for our dry air and low humidity. Average spring and fall temperatures range in the low 70's; average winter temperatures drop to 55 degrees; summers average in the high 90's. At 1740 feet elevation, Ajo is slightly cooler than Phoenix. Ajo is an oasis in the Sonoran Desert where migratory birds rest on their journeys, coyote howl at the moon, and springtime carpets the land in a riot of brilliant wildflowers. The rock formations of the nearby Crater Range have been used as the backdrop for numerous Hollywood movies, while the white sand beaches of the Gulf of California (the Sea of Cortez) beckon from only 100 miles away. 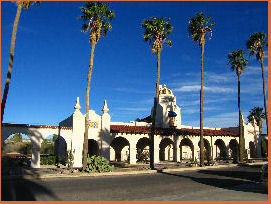 Ajo (year-round population, 3750) offers a pool, golf course, museum, municipal airport, emergency services and K-12 public education, Ajo Schools. High-speed internet access, library, health center, pharmacy and a variety of shops provide the amenities of urban life without the big box stores, auto-rows or endless miles of concrete. We hold art fairs and street fairs, offer concerts and dancing in our parks, enjoy local theater and visits from the Tucson Symphony, and we let our kids ride bikes, skateboard and roam the hills in safety. We are friendly, open and trusting. We are unlike any place you've ever been. Come for a visit. Plan to stay for a lifetime. Besides these annual events, Ajo holds a Farmers Market in the Plaza the second and fourth Saturday during April-December, and every Saturday in January-March. Vendors offer delicious locally grown produce, fresh eggs, baked goods, botanicals, crafts, and art. Check these websites for more information on events: www.ajochamber.com and www.isdanet.org. Ajo hosts many events throughout the year. In February it’s the Old Time Fiddlers and the Ajo Peacemakers Annual Quilt Show. In March there is the Ajo Regional Food Festival, the Sonoran Shindig, and either the Tri-National Symposium on the Sonoran Desert or the Community Arts Gathering (these are held on alternate years). There are festivities on Cinco de Mayo and the 4th of July, and the third week in September brings the International Day of Peace parade and celebration. Thanksgiving week-end offers special art events and exhibitions. The year wraps up with Santa’s appearance in the Curley School tower and his sleigh ride to Ajo Plaza. Ajo is 100 miles southwest of Phoenix, 120 miles west of Tucson, and 40 miles north of the Mexico-Arizona border. Ajo is centrally located in a region of important art and crafts fairs. The galleries and art markets of Phoenix, Scottsdale, Sedona, Tucson, Bisbee and Tubac are within a few hours' drive. San Diego and Santa Fe are a day away. The Curley School is in the very heart of the downtown historic district of Ajo, Arizona, nestled between the gracious palm-treed plaza and distant "A" Mountain (you'll know it when you see it). Ajo is protected from pollution and urban sprawl by being surrounded by lands splendidly unavailable for development: the Tohono O'odham Nation, Cabeza Prieta Wildlife Refuge, Organ Pipe Cactus National Monument and the vast tracts of untouched Sonoran Desert managed by the Bureau of Land Management (BLM).